.Honestly I think that my artistic drive came at the knee of my Mom,who is now 91 years old. Just a few years ago I told her how when I was four years old I can remember her working on a portrait of me...when I looked at the portrait as a haughty four year old I was sure that I could make the watercolor portrait better and wanted to help my Mom with her painting. I didnt want to do anything else but paint. I even managed to be an art major in high school. Attended the Pennsylvania Academy of Fine Arts in Philadelphia where I met and married my Greek Artist husband. I wake up in the morning and simply put ,have to paint...someone has to remind me to get up and move around because I become totally emersed in what I am currently working on.I live with two goofy cats who even though I brought them home from the Vorhees shelter truly adore my husband. My cats seem to permeate a lot of my small works. I tend to binge paint and have to work out on certain subjects until I move onto the next subject. My medium of choice is watercolor and pen and ink.....once in a great while I am tempted to work in other medium but always head back to my favorite choice. Currently I am doing quite a bit of paper mosaic pieces...there is just something that is challenging but also relaxing about working with mosaics. 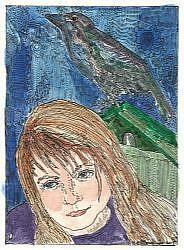 For the last two years I have been doing miniatures ACEO'S which are 2 1/2" x 3 1/2 ". I'm tryiing to see how many I can create before I move in another direction. My work lends itself to miniatures although I have done enormous paintings that are very detailed...some pieces took as long as a year to finish.My work isnt done until I put down my pen.